When my friend Diane suggested a ghost walk around Chippenham I expected it to be quite short as I hadn't at that point come across many spooky stories about the town. Not only did I manage to keep 15 women and a baby entertained for a couple of hours, they also added some tales of their own. The stories started straight away with the tale of Old Maudy, who awaits her lover's return from the war whilst sitting on a bench at the railway station. Wendy and I are quite relieved we've not seen her on our commutes! Naturally we speculated exactly which bench it might be. As you can see there are quite a few to choose from... and I haven't photographed them all. Here are some of the places with tales to tell. Seeing there are so many old buildings centred around the Market Place - which also hosted a hangman's noose for quite some time and is rumoured to be cursed - I should have guessed the walk would be a viable one. I've followed this tree up the ramp at Cabot Circus car park in Bristol many times. Its buttery yellowness and being forced to park on the top floor finally persuaded me to take a longer look, much to the annoyance of some motorists. I didn't care. I was 'parked' on a little step and could safely peer my camera over the edge to take this picture. To my delight I found a Ginkgo biloba. It's surprising a tree can survive being planted in such a space, never mind one of the more unusual ones. Later that day I realised the city centre's street tree planters seem to have a special fondness for this specimen. They're everywhere. Here's one of several I found later in Broadmead. It's not the first time I've got excited about this species... here's a golden tale from the garden at Bath's Holburne Museum. It's Apple Day tomorrow and what a bumper crop we have chez VP Gardens and on the allotment this year. Today's post comes as a slightly premature celebration as we have family matters to attend to over the weekend. We enjoy fruit juice as a weekly treat on Sundays with our roast dinner, so it was a natural step to invest in a juicer. I swithered between this and an apple press, and in the end I plumped for a juicer as it's cheaper and fulfils our immediate needs. I did have a daydream about pressing oodles of juice for a full year's supply, but practical matters such as pasteurisation and storage swiftly brought me back to reality. 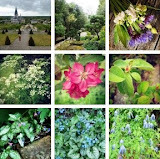 I haven't grown many new-to-me plants in the garden this year; most of those delights are currently up at the allotment for my Flowers for Mum project. The exception is the pictured scabious 'Kudos Purple', a plant I've trialled courtesy of Thompson & Morgan (T&M) via February's Garden Press Event. I'm having a bit of a 'Should've gone to Specsavers' moment because none of my plants are purple, but pink, and a look at T&M's online catalogue confirms they are indeed... er, pink. Why not call them 'Kudos Pink' then?!? Chippenham lost one of its iconic buildings yesterday, known locally as the White House. This was the view of it from the end of the platform at the railway station. It was part of the Westinghouse (then Invensys then Siemens) site where NAH worked, and I always looked out for it coming home on the train from Swindon or London. Not only did the White House welcome me home, it was my signal to get up and leave the train. A few weeks ago I arrived ultra early for a train one Saturday morning and knowing of the White House's imminent demise, I decided to have a final look. The site is being cleared for redevelopment and I've never understood why this building couldn't be incorporated into the housing scheme set to replace it. There is nothing quite like it in the rest of Chippenham and I'm sure there was scope for conversion into apartments. Some days are destined to be extra special and the last day of September was one of them. Not only did I get to swan around a secret garden in the heart of London, I - along with twenty or so other garden bloggers - had the good fortune to meet Monty Don and preview his latest book, Down to Earth. ...nestled close to Piccadilly Circus and whisked up to the fourth floor, there's a different world waiting to be explored. It's a beautiful, productive roof garden complete with a bug hotel, bee hives and a green roof on the shed. It was a great space to explore with my blogging buddies and unlike my poor tomatoes, the hotel's were still going strong with not a hint of blight. I also envied the huge aubergines and curly chillies in the display. I was struck by the quotation I found for Friday's Thresholds post, and thought it worthy of a repeat for today's Muse Day. 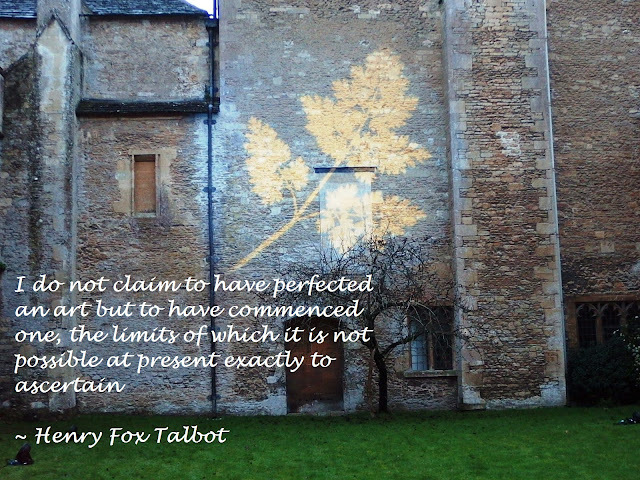 What a prescient notion in Fox Talbot's words. This time I've superimposed it on a photo I took at 2014's Illuminating Lacock Abbey exhibition. The projected image is another of Fox Talbot's and a similar one was on display in Thresholds. It was a spine tingling feeling to 'hold' this image in my hand via the magic of Virtual Reality.